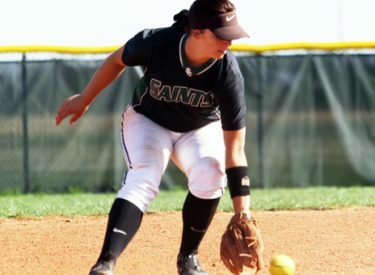 With the newly crowned Saints Hall of Famer and former Lady Saint All-American Courtney Auger, Seward County was hoping for a jolt of energy Saturday afternoon at Lady Saints Field in Liberal as they resumed their April 14th game with Barton down 9-0. There would be no such luck as Seward failed to fight off the run rule as the Cougars took a 10-1 decision to drop the Lady Saints to 3rd place in the conference standings for the first time this season. Seward started Saturday already down 9-0 to the Cougars as Barton scored four in the 1st, one in the 2nd, and four more in the 3rd way back on April 14th before weather forced the temporary postponement of the contest. After resumption Saturday, Seward failed to score in their halves of the 3rd and 4th innings while keeping the Cougars off the board in the 4th as well as it remained a 9-0 game to the 5th. Barton tacked on their tenth run of the game in the top of the 5th to go ahead 10-0. Seward scored their only run of the game in the bottom of the 5th as Maycee Koontz grounded out to bring home a run, but it wasn’t enough to fight off the run rule as Barton took it 10-1 in five. Barton outhit Seward 11-5 in the game as Alexis Cuellar was the only Lady Saint with more than one hit in the loss. Ruby Gonzalez took the loss in the circle, allowing nine runs, all earned, in just 2 2/3 innings of work to fall to 9-6 on the year. The game was only to be resumed if it had an effect at the end of the season on the conference standings, and oh did it. Seward falls to 39-18 overall with the loss and 14-8 in Jayhawk West play where Barton now holds the tiebreaker on them for 2nd. The Cougars win the season series against the Lady Saints to improve to 29-12 overall and 14-8 in league play.